Bengalis have a nostalgic attachment to Darjeeling. But for most other Indians, except for its tea, the place hardly has any special distinction among the dozen hill stations that the British had built in India in the 19th century. So, when my memoir on Darjeeling was ready for release in July this year, I knew it would be a quiet book to be slotted in discreet corners in bookshops. And then, in June, Darjeeling suddenly was in the national news. A couple of my blase friends congratulated me for what they considered to be a stroke of serendipity. This hurt. My book is a bittersweet ode to the beautiful hill town and its people, and what had prompted me to write it, among other things, was the urge to reach out to my friends there. Suddenly I couldn't contact them: their phones were either switched off or unreachable, their Facebook pages inactive. 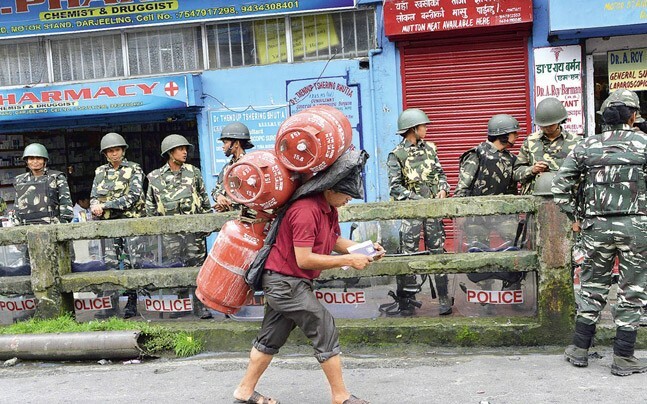 A bandh had been called in Darjeeling, the Internet service suspended, in fact all essential services were shut down, the hill sub-divisions were cut off from the rest of the state and the country. This continued for a hundred days. To make matters worse, this was also the season of rains. There were landslips and snapped power lines, with no repair and restoration in sight. The season of rains is the most difficult in Darjeeling hills, especially for an outsider. As summer scorches the surrounding valleys, puffs of vapour climb up the ravines to cast a pall of fog and blot out the picturesque views for which the town is famous. Then comes the rain. Rain falls relentlessly through the day, the sun cannot be seen for weeks, a nagging dampness pervades the air and a weak grey light disarranges the different hours of the day. Depression sets in. During my stay in Darjeeling in the 1990s, I had to battle this depression, especially during the first two years. Now, as the news of trouble-torn hills trickled in, I began to relive those memories. I remembered the murky light, the giant moths that swarmed at lighted windowpanes, the furry street dogs curled upon the railway platform, the droplets of water drumming on the leaves of tree fern, the rain-slicked mane of a solitary horse on the Observatory Hill, the rash of wild blue flowers in roadside cuttings, and the murmur of a swollen spring in the pine grove on Convent Road. I could imagine how desolate the town would be during a 100-day-long bandh, virtually a ghost town, with the market closed and the porters gone back to their villages, the local people keeping indoors and the toy train service suspended. I could almost see in my mind's eye the silhouette of a lone umbrella on a foggy road and the squelch of a solitary pair of sandals ricocheting off the shuttered shops at Chowk Bazar. I, too, had seen bandhs in Darjeeling. It usually started with a poster on a wall near the taxi stand. Soon a small crowd of idlers would gather in front of it. The passers-by would slow down and cast fugitive glances. Within minutes, the news would spread like a forest fire. By early afternoon, long queues would form before cash counters at the banks (ATMs were still a few years away). Then, perhaps a procession would worm its way to the collector's office. By late afternoon, paramilitary vehicles would roll into the streets. Porters laden with baskets of provisions would walk briskly, followed by well-to-do townspeople. Their hard-up counterparts would come late at the market, after the pumped up prices at the green-grocer's had subsided. The local service jeeps, their roof-top carriers laden with sacks of potatoes and egg trays, would rev up their engines at the taxi stand. Their drivers' frantic calls would echo in the dimming daylight: Sukia-Manebhanjan-Sukia!/Lebong-Lebong-Lebong!/Last turn! Last turn! Last turn. After this no vehicle would ply on hill roads, Darjeeling would be completely cut off, not only from the plains but also the settlements scattered all over the hills. A bandh would bring into sharp focus the precarious geography of a hill station and its dependence on the outside world for survival. And yet people here have survived longer bandhs with surprising grit and resourcefulness. All this in support of a cause. The cause, the demand for a separate state, is one of the oldest in the coun-try and yet it has always eluded them. When I first went to Darjeeling in the early 1990s, a violent agitation had just ended, taking away 1,200 lives. A whole generation had lost the capital of their youth and there were shards of dashed dreams all around. Two decades later, a new young generation had appeared on the scene; there was another uprising, another leadership, another bandh that stretched on for months, another missed appointment with the cause. A feeling of deja vu was unavoidable. I could feel, from a distance, the depth of frustration and cynicism stalking the hills. On September 5, I received a greeting on Facebook messenger from a friend in Darjeeling who'd been my student two decades ago. He also sent me a photograph: of a dozen young people huddled at a spot on the road behind the Observatory Hill, popularly known as the Back Mall, each holding a smartphone raised at a particular direction. I learnt that a faint broadband signal emanating from Sikkim was sometimes available at that spot and, with the Internet ban still on in Darjeeling, the young people were making use of it to connect to the outside world. 'How are you coping?' I messaged him. In reply, he sent me a big smiley. Then his signal went dead. A beaming smile on the face of a Darjeelingee is as dazzling as the snowy range of Kanchenjungha against a blue sky, and as famous as the tea that is grown here. It is now a metaphor in West Bengal's politics: Darjeeling is smiling means everything is hunky-dory up there. After the hundred-day bandh and the loss of a dozen lives, the haemorrhage in tea and tourism industries and scores of young people losing an academic year, things in the hill station are limping back to normal. The season of rains has also passed and there is fine sunny weather there. So yes, Darjeeling is smiling. But shadows lurk under the eyes and biles of frustration have welled up behind the lips. Nobody knows when the face would tighten again and the smile would vanish, because no path in Darjeeling is straight.